Decorated with a series of four star reviews folk chanteuse and harpist Brona McVittie is quietly steering traditional folk into the 21st century with her recently launched debut solo album We Are the Wildlife — a deep reflection on the interconnectedness of things natural and manmade, an album of duality and dichotomy shaped as much by natural sonic patterning as by human patterns of behaviour — inspired by rural and urban scapes alike. “Electronic music, used judiciously, can serve the folk song well, particularly when it’s teasing out subtler textures in the tradition, noticing the smaller stitches in its seams. This is certainly true of the work of Brona McVittie” says The Guardian who describes her music as “Beautifully embroidered folk with sweetness and bite”; “A rare, and rarefied, beauty” The Independent; “Heavenly” Uncut; and “Timeless” Mojo, the album has aired on BBC6 Music by Gideon Coe and Lauren Laverne; BBC Radio Ulster by Lynette Fay, Eve Blair and Across the Line; and RTE Lyric FM on The Blue of the Night. “McVittie takes her inspiration from W.B. Yeats’s idea of a kind of Celtic phantasmagoria which can be felt but remains essentially ineffable.” Mojo. 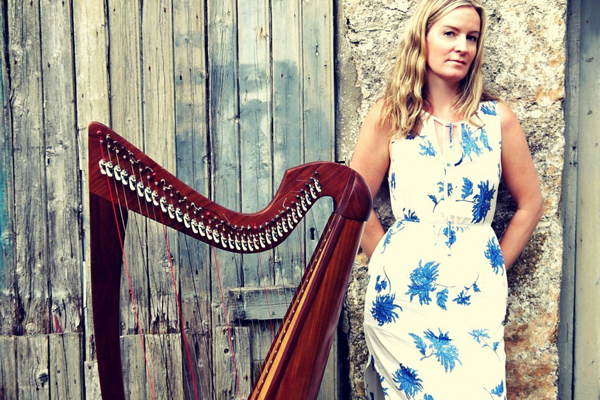 Aside from her fledgling solo career, Brona has built up widespread international acclaim for her work with Irish all-female folk legends The London Lasses, a capella ensemble Rún and post-folk trio littlebow. She appears at Purbeck Folk Festival accompanied by Myles Cochran on slide guitar.